Carter Swank of Swanton loads up prior to getting a single in the bottom of the sixth inning Monday against Bryan. Swanton shortstop Hunter Mix throws to first for an out versus Bryan Monday. The Bulldogs fell to the Golden Bears 10-5, dropping them to 0-3 in the league. 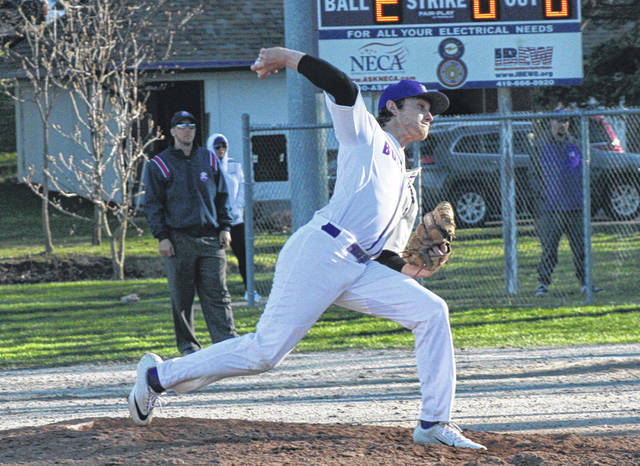 Swanton pitcher Roman Epley went six innings in Monday’s loss to Bryan. 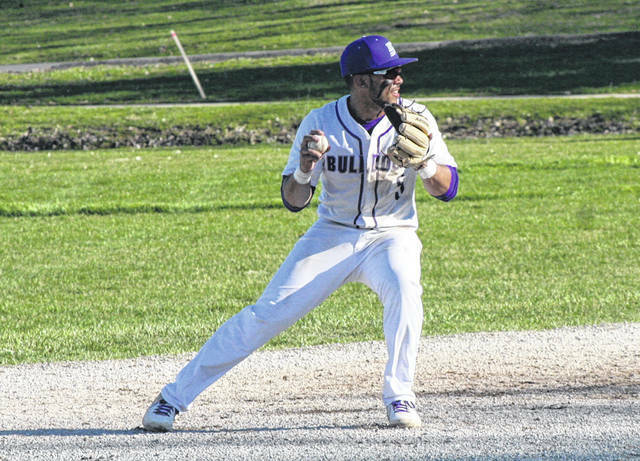 Swanton stuck with preseason league favorite Bryan for six innings until the Golden Bears broke through with five runs in the top of the seventh, defeating the Bulldogs 10-5 in Northwest Ohio Athletic League baseball action Monday in Swanton. The Bulldogs dropped to 0-3 in the league following the loss. Bryan’s Zach Dye banged a single through the left side of the Swanton infield to begin the seventh inning charge. Connor Arthur and Dom James each followed with perfectly placed bunts for singles that loaded the bases, subsequently ending the day for Bulldog starting pitcher Roman Epley. After Hunter Mix relieved Epley, the Golden Bears’ Breven Deckrosh drilled a two-run single to put Bryan in front. A Trevor Ward sacrifice bunt put two Bears in scoring position, however, the Dogs then elected to intentionally walk reigning NWOAL Player of the Year Nate Miller, in hopes of enticing an inning-ending double play. Nevertheless, it was not meant to be. Brooks Brown got a base hit to right, and when the ball took a bad hop on the right fielder, two runs scored for a 9-5 Golden Bear lead. Then, Logan Clemens’ shot to deep left field dropped on an error to bring home the game’s final run. Epley led off with a base on balls to begin the home half of the seventh, but three straight strikeouts stranded him at first base. Swanton did do a nice job of recovering after falling in a 4-0 hole to start the game. They quickly answered back, scoring four runs of their own in the bottom of the first. Michael Lawniczak got it going by reaching on a catcher’s interference with two outs. Epley’s base hit put runners at the corners, then Derek Floyd reached on a Bryan drop in left, scoring Lawniczak. The Dogs would tie it at 4 as Epley, Floyd, and Billy Nowakowski each came home on wild pitches before a strikeout ended the threat. Both squads added a run in their half of the second, making the margin 5-5. Bryan’s run came after a one-out double from Miller. He was advanced to third on a ground out, Clemens drew a walk, then an errant pickoff to first in an effort to put out Clemens plated Miller. Swanton forced out Bryan starter Benny Roebuck during an at-bat in the bottom of the inning. With Tommy Chonko already having walked and Mix ahead in the count 2-0, Golden Bear skipper Jeff Inselman elected to pull him in favor of James. However, Mix worked a walk and the Dogs loaded the bases with Carter Swank’s bunt single. This allowed them to tie it on a fly to deep center from Lawniczak. With some quality defense, the Dogs were able to keep Bryan off the board in the middle innings. The Bears got the leadoff man on in the fourth, fifth, and sixth innings, but each time they failed to score. Epley was charged with the loss for Swanton, despite giving a valiant effort after a rough first inning. Swanton had their non-league meeting at Bowsher Tuesday canceled due to poor field conditions. The Dogs resume NWOAL play Thursday at Patrick Henry, then they visit Sylvania Northview Saturday with an 11 a.m. start. 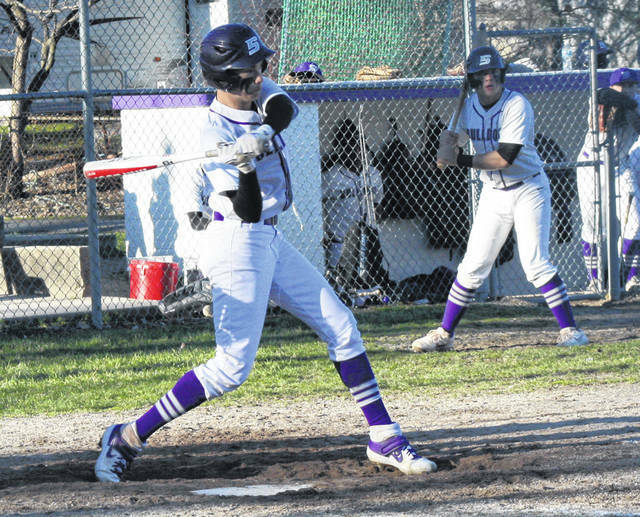 https://www.swantonenterprise.com/wp-content/uploads/sites/23/2019/04/web1_Carter-preparing-to-swing.jpgCarter Swank of Swanton loads up prior to getting a single in the bottom of the sixth inning Monday against Bryan.